Baku, April 15, AZERTAC The 36th International Drug Enforcement Conference (IDEC), co-organized by Azerbaijan`s State Commission on Combating Drug Abuse and Illicit Drug Trafficking, State Customs Committee of Azerbaijan and U.S. Drug Enforcement Administration (DEA), has kicked off in Baku. Held under the motto “Leveraging global partnerships”, the two-day conference aims to bring together the high-ranking officials to fight against illegal drug trafficking and to discuss the ways of solving this global problem. Attended by around 500 representatives from over 150 countries, the international conference will create an opportunity for the experts to benefit from the modern methods of combating drug trafficking. 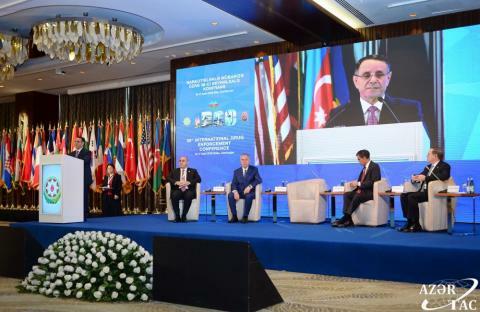 Prime Minister of Azerbaijan Novruz Mammadov made a speech at the event. Speech of Prime Minister of Azerbaijan Novruz Mammadov Esteemed conference participants, dear guests! First of all I welcome each and every one of you here in Baku, welcome to Azerbaijan. The International Drug Enforcement Conference is one of the most prominent events organized in the field of combatting drugs. I am confident that this very conference will make an impact, in terms of evaluation of the international experience in the area of combatting illicit drug trafficking and money laundering, and also boost cooperation in this particular field. This event will also be conducive to a productive exchange of expertise with other countries. Holding of such an event of global relevance, that brings together in Baku the specialized agencies and experts, is appraisal of the Republic of Azerbaijan’s international cooperation in the fight against drugs. I want to underline that the Organizing Committee on holding the 36th International Drug Enforcement Conference in Baku was established by President Ilham Aliyev’s decree on 15 November 2018. The Prime Minister’s office issued another decree setting up a Working Group and approving an Action Plan. Azerbaijan has hosted a number of significant international events in recent years. Among others I wish to highlight the 7th UN Alliance of Civilizations Global Forum, World Religious Leaders Summit, Global Baku Forum, Baku International Humanitarian Forum, World Intercultural Dialogue Forum, the Southern Gas Corridor Advisory Council’s meetings, Eurovision Song Contest, First European Games and Fourth Islamic Solidarity Games. This year Azerbaijan will continue this tradition and host large-scale international events. In a few days time a Formula-1 Grand Prix will kick off in Baku. Furthermore, Non-Aligned Movement Summit, where Azerbaijan is a chair for 2019-2022, World Religious Leaders Second Baku Forum, European Youth Olympic Festival and UEFA Europa League Final will all be held in Baku. In the 28th year since regaining of its independence Azerbaijan’s multifaceted foreign policy is based on the principles of mutually beneficial cooperation and partnership will all countries. Azerbaijan is also actively involved in different bilateral and multilateral international platforms to contribute to peace and security. Azerbaijan has already proven itself as a reliable partner on the international arena. Transnational energy and transportation-logistics projects that Azerbaijan has initiated and is part of have made our country a key partner both on the regional and global level. Azerbaijan plays a leading role in energy and transportation corridors linking the East with the West, the North with the South. Baku-Tbilisi-Ceyhan, Baku-Tbilisi-Erzurum, TANAP and oil and gas pipelines, as well as the TAP project which is under construction, have changed entirely the vast region’s energy map, by supplying oil and gas resources to Europe. Today Azerbaijan plays a significant role in ensuring Europe’s energy security. Azerbaijan is cooperating successfully with the United States of America in many areas, including security and confronting global risks and threats. Azerbaijan was one of the first countries to join the international anti-terrorism coalition led by the U.S. Azerbaijan and the United States joined forces in fight against terrorism and illicit drug trafficking on the regional and global level. Dear conference participants, Illegal drug trafficking and drug addiction is one of the most alarming modern day problems for the entire world. Regrettably, drug addiction has become a terrifying phenomenon that plagues most of the countries around the world. Among other consequences, this evil forces a drug user to commit all sorts of crimes, thus undermining society’s moral and intellectual potential and deteriorating the gene pool. Illicit drug trafficking causes the rise in crime rate and is regarded as one of the most serious threats to the international security as a source of financing of the international terrorism. Since the early days of our independence national leader Heydar Aliyev highlighted the importance of healthy development of our society, and I quote, “Fight against drug addiction and drug trafficking is a fight of every country and nation for its physical and intellectual well-being”. The political course of Heydar Aliyev has successfully continued by President Ilham Aliyev. Thanks to the implementation of comprehensive measures Azerbaijan has taken its rightful place among the family of nations. President Ilham Aliyev’s position of principle, where he demands result-oriented performance from the law enforcement agencies in tackling the drug addiction, reflects Azerbaijan’s unwavering stance against the spread of this universal malice across the country. The policy of ensuring socioeconomic stability and safeguarding of health, wellbeing and moral-ethical values has identified the fight against drug addiction and drug trafficking as a top priority national objective. To that end, Azerbaijan has introduced appropriate state programs, streamlined the legal framework, carried out institutional reforms and joined relevant international initiatives. The State Commission on Fighting Drug Addiction and Illicit Drug Circulation was established in 1996. In the last fifteen years, President Aliyev has issued 13 executive orders and 56 decrees, while the Parliament adopted 38 legislation acts in this particular area. Several state programs were drafted and are already being successfully implemented. Azerbaijan has also joined a number of international conventions with respect to fighting illegal drug trafficking. One of the top priorities for Azerbaijan is to have a unified strategy as it tackles drug addiction and drug trafficking. We have increased the awareness raising campaigns’ outreach and implemented complex preventive actions. We are continuing the systematic efforts aimed at stepping up the fight against trafficking of illegal drugs and their precursors, the drug addiction and treatment of drug addicts and their return to healthy lives. Moreover, scientific and practical research continues to enhance the level of treatment and rehabilitation that meet modern day demands. Dear conference participants, President Ilham Aliyev’s dedicated policy and profound economic reforms have ensured the country`s development. Azerbaijan’s achievements are acknowledged by the international organizations and leading financial institutions. I wish to stress that this year Azerbaijan ranked 25th in the “Doing Business” report by the World Bank. All of our economic indicators are positive and I would like to share them with you. Last year our economic growth stood at 1.4 percent. The non-oil sector of the economy grew by 1.8 percent, while the non-oil industrial growth was 9.1 percent. Country’s economy received $ 250 billion in investments and the economy itself more than tripled in the last fifteen years. Poverty dropped from 49 to 5.4 percent, some two million jobs were created and today the unemployment stands at 5 percent. Last year Azerbaijan launched its third satellite and further strengthened its position as a space nation. In 2018, the Southern Gas Corridor was officially inaugurated, the Alat International Sea Trade Port commenced full operation. Thus, Azerbaijan is now known as a transportation hub and a transit country. In recent years a lot has been done in terms of creating modern infrastructure in the country. Some 15 thousand kilometers of roads have been built since 2004. It is no coincidence that according to the World Economic Forum, Azerbaijan ranks 30th in infrastructure development and 34th in terms of quality of road infrastructure. While Azerbaijan’s achievements in the social and economic life are critical for combating drug addiction, they also highlight concrete objectives for the government and law enforcement agencies in eliminating existing flaws. Thanks to sound reforms and consistent measures 8.35 tons of drugs were seized in the last five years. Modern drug addiction treatment and rehabilitation facility was built and put into operation. Based on the best international practices, experts are brought in for regular awareness campaigns and opinion polls held in higher and vocational learning institutions, boarding schools and correctional facilities. Exchange of expertise is a goal of different seminars and trainings held throughout the year jointly with the international organizations. I want to underscore that the international community is deeply concerned by the military conflict zones being used for illegal drug trafficking. Azerbaijan also faces such a problem. As you know, Azerbaijan’s historical land of Nagorno-Karabakh and seven surrounding districts have remained under occupation by the Armenia’s armed forces for more than 25 years. Use of those occupied territories for cultivation and trafficking of drugs has created fertile ground for flourishing drug business and spread of international terrorism. Economic activity of companies that are allowed to operate in the Armenia-occupied areas perpetuates the occupation and creates environment for other crimes. Elimination of such crimes is possible through prevention of economic and financial activity in the occupied territories and restriction of money transfers and investments. Azerbaijan has “black lists” in place to exercise effective control over the situation. We urge the respective countries to take appropriate actions against the entities and individuals that are known to be involved in such illegal activities. This conference provides an opportunity to reach out directly to respective countries in order to prevent such illegal economic activity. We hope that serious measures in that direction will make a positive impact. Dear conference participants, I am confident that at this International Drug Enforcement Conference you will engage in productive discussions and an open dialogue based on mutual respect, and from the capital of Azerbaijan send out a message to the world to strengthen the fight against this universal malice. Thank you for your attention. Addressing the event Deputy Prime Minister, Chair of the State Committee on Combating Drug Abuse and Illicit Drug Trafficking Ali Hasanov expressed his gratitude to President Ilham Aliyev for the establishment of the Organizing Committee and support for the high-level organization of the 36th International Drug Enforcement Conference. “IDEC is an important event in countering illicit drug trafficking and it plays a special role in addressing issues related to strenghtening international cooperation, sharing best practices, discussing important issues, and exchanging a wide range of information, including the current trends in drug trafficking. Global economic integration, development of transportation links, aimed at facilitating trade and large-scale cargo transportation are accompanied by crossborder drug trafficking in certain parts of the world,” Deputy Prime Minister said. “Successful economic policy implemented by President of the Republic of Azerbaijan Ilham Aliyev over the past 15 years, has resulted in a fast upturn in the country’s economy. Economic development, implementation of international projects, such as Baku-Tbilisi-Kars railway, construction of a new seaport, motorways and international airport, and the revitalization of the tourism sector have triggered increase of flow of tourists, foreign experts and migrants to Azerbaijan as well as significant increase in freight transportation. International organized drug trafficking groups are also aware of these developments and attempt to use them for illicit drug traffcking. The threat to humanity posed by drug trafficking necessitates the introduction and operationalization of state-of-the-art control system at both the national and international levels,” he said. “Establishment of the State Commission against Drug Abuse and Illicit Trafficking in Narcotic Drugs, by the Decree of national leader Heydar Aliyev, dated 26 August 1992, to ensure socio-economic stability, maintain the overall health status, well-being and moral and behaviroral values of people had elevated countering drug problem to the state level. The Republic of Azerbaijan has become a party to relevant UN conventions and built up its own legislative framework in compliance with respective international norms and standards, and supported related activities of the international community. Three state programs on countering drug abuse and illicit trafficking in narcotic drugs, psychotropic substances and their precursors have been approved by President İlham Aliyev and successfully implemented. The fourth program for 2019-2024 has been submitted for the presidential approval. As a result of President Ilham Aliyev’s efficient work our state system as well as political and economic independence have further strengthened, continuous and sustainable development and rapid modernization of our country has been ensured. Azerbaijan has secured its place among rapidly developing nations.” “The country has managed to set up and develop close cooperation and relations with neighboring and other countries, as well as regional and international organizations in the field of countering drug abuse and illicit drug trafficking. Azerbaijan with its up-to-date transportation infrastructure has become an important transit country for internationl freight movement between Europe and Asia. One of the major problems in the area of illicit drug trafficking is smuggling of the drugs to and through the territory of the country, which is caused by the country’s strategic location on the transit routes from the East to the West. During the last years police, customs, border control and security authorities equipped with up-to-date technical means have strengthened their activities in countering illicit drug trafficking and carried out numerous preventive and operational activities to detect drug smuggling cases by different routes seizing significant amounts of narcotic drugs from criminals. Following the presidential order to improve the drug abuse treatment service, the Ministry of Health commissioned a brand-new drug treatment and rehabilitation center in Baku. Various joint projects implemented by the State Customs Committee, in cooperation with the World Customs Organization and UN Office on Drugs and Crime, and profound reforms have led to a considerable increase of seizures of narcotic drugs by law-enforcement and other competent agencies. Since 2018 through the 1st quarter of 2019, the State Customs Committee alone detected and seized 1.714 tonnes of narcotic drugs at border crossing points (BCPs) on respective transit routes including 1.488 tonnes of heroin. Azerbaijan’s location on international drug trafficking routes necessitates vigilant counteraction on a daily basis, and therefore the countering illicit drug trafficking has been identified as a social and security priority for Azerbaijan. The Armenian state’s and Armenian nationalists’ aggression against Azerbaijan has left some 20 percent of our territory under occupation for 27 years, more than one million Azerbaijanis having fallen victims to ethnic cleansing become refugees and internally displaced persons. Despite four resolutions by the UN Security Council, as well as similar decisions by OSCE and the Council of Europe, the Armenian armed forces continue the occupation, so that a 132-km section of the Azerbaijan-Iran border has become an uncontrolled zone. This fact was reflected in the World Drug Report 2010 by the UN Office on Drugs and Crime. Notably, this area is used for illicit drug trafficking to Europe and other countries, the territories under occupation are utilised for cultivation of narcotic plants, operation of laboratories producing new types of synthetic drugs, developing the basis for production and transit of drugs, using the proceeds from the drug for acquisition of sophisticated weapons, recruitment and training of terrorist groups to engage them in other conflict areas, thereby escalating the extent of the existing threat. Defying the norms and principles of international law, democratic values and human rights, this occupation policy poses a threat not only to the region but also to the entire world,” Deputy PM Hasanov added. Ali Hasanov noted that according to the World Health Organization roughly 450,000 people died as a result of drug use. Other speakers at the event included Chairman of the State Customs Committee Safar Mehdiyev and the US Ambassador to Azerbaijan Earle Litzenberger. IDEC was established by DEA in 1983 with the objective of creating a multilateral forum for the international police and prosecutor community to strengthen international relations and counternarcotic cooperation, share drug-related intelligence and to develop operational strategies that can be used to combat transnational, organized criminal organizations involved in the illicit drug trade. What began with less than a dozen countries in 1983 has grown to well over 130 member and observer IDEC countries, and several affiliate police observer organizations. The first IDEC was held in 1983 in Panama City, Panama.